Brazil great Pele has tipped Kylian Mbappe to match his legendary achievements. Pele, revered as one of the greatest players of all time, won the World Cup three times as well as guiding Santos to six Brazilian league titles and two Copa Libertadores in a glittering playing career that ended in 1977. 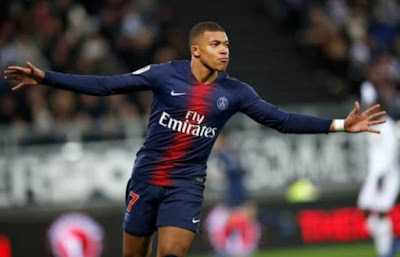 Paris Saint-Germain striker Mbappe has a long way to go to coming close to matching the 78-year-old but made a promising start by playing a leading role in France’s World Cup success in Russia. “He won the World Cup at 19, I was only 17,” said Pele, who shot to prominence as a teenager in Brazil’s World Cup success of 1958. “I teased him saying he had almost equalised. Mbappe has emerged as arguably the key man at PSG, ahead of Brazil captain Neymar, who continues to be linked with a move back to Barcelona. The world’s most expensive player has occasionally struggled at the Parc des Princes but Pele was quick to offer encouragement. “A father does not criticise, he educates,” he said. “He is a son of Santos.